This research laboratory is the core of the center’s environmental risk research. The laboratory conducts research on the ecological impacts of environmental chemicals and assesses the health effects of exposure to environmental chemicals. The first floor is dedicated to research on the ecological impact of environmental chemicals in aquatic organisms. The second floor houses various instruments for chemical analyses (e.g., gas chromatography- tandem mass spectrometry and liquid chromatography-tandem mass spectrometry) and a confocal laser microscope. In vitro bioassays to assess environmental quality are also conducted on the second floor. The fourth floor is divided into two areas: one for gathering, analyzing, and assessing information regarding the risks associated with chemical substances; and one for conducting animal testing to clarify the health risks associated with exposure to environmental chemicals. This laboratory conducts experiments using laboratory animals and tissue and cell cultures to investigate the effects of various environmental chemicals on human health and determine whether environmental pollutants have adverse effects on human health. The urban atmosphere remains polluted with particulate substances emitted from automobiles. Therefore, this laboratory investigates the effects of ultrafine particles contained in diesel exhaust and environmental nanoparticles on human health. 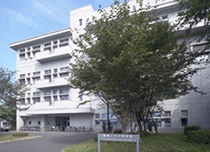 The Nanoparticle Health Effect Laboratory is connected with the Animal Laboratory building and is equipped with advanced inhalational exposure chambers.